Alphabetic tower is one of the many skyscrapers of Batumi. The tower symbolizes the uniqueness of Georgian alphabet and people. 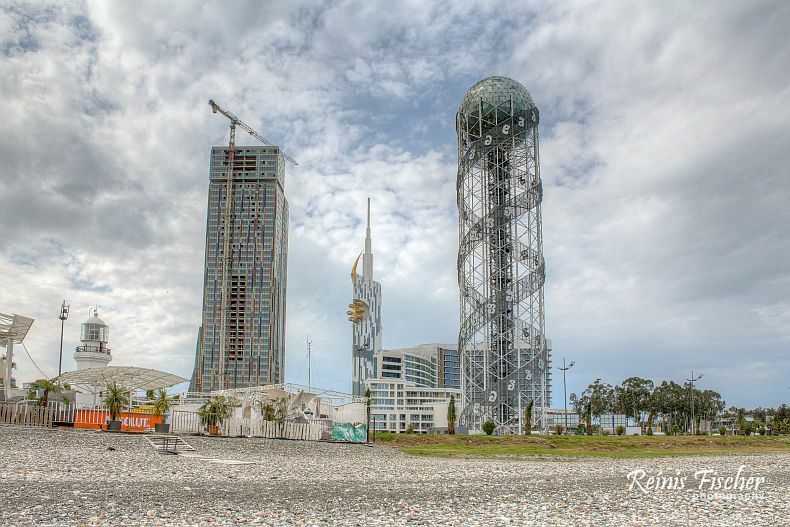 Located in the Miracle park, Alphabetic tower of Batumi can be considered as one of the main tourist attraction sites in the city. Alphabetic Tower is a total of 130 meter tall. The structure combines the design of DNA, in its familiar double helix pattern. Two helix bands rise up the tower holding 33 letters of the Georgian alphabet, each 4 meters tall and made of aluminum. In the middle of the building is an exposed elevator shaft leading to very the top of the building, in the crown of the structure, where a colossal silver ball is located. Alphabetic Tower was built by Spanish company CMD Ingenieros. Construction began on 10 October 2010 with the exterior of the structure completed in December 2011. The building cost $65 million to build.